Neil Armstrong was 82. He was the first man to walk on the moon. Wow - a true pioneer. I don't know if most people today appreciate the courage this man and his fellow astronauts had, strapping themselves into a giant missile, hoping to get to the moon. When I think about everything we've accomplished in space exploration, including the latest Mars rover, we owe a huge debt to Neil. I'll never forget watching the first steps on the moon on TV with Mom & Dad late that night. Who was the 2nd person to take foot?? I don't think I watched it, but I remember we talked about it lots in class when I was a kid and talked about space ships and space suits and how people went to the moon. I'm pretty sure we all know that was Buzz Aldrin. I'm floored now. Rest in peace, Neil, for what you've done. A huge loss, obviously. A great man and probably the last explorer to set foot on genuinely new ground for a while. Until we get to Mars, anyway. 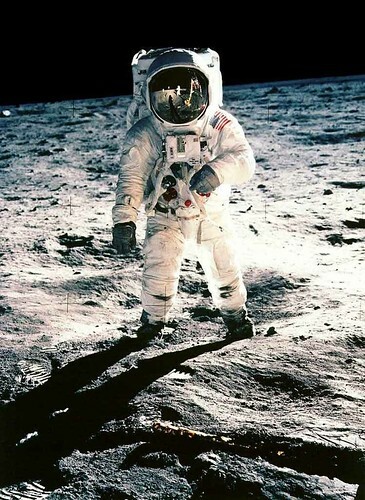 That iconic photo up there is actually of Buzz, however (it was taken by Armstrong). I'm with Corey on this one. Bravery second to none. All of those guys were true heroes. Too bad his first steps were in a studio & that he had to memorize those lines instead of acting on real emotion. Moon landing was a fraud.